Does the title of this post freak you out a little? Like how is it almost November and Thanksgiving?!?!?! Last weekend, I even started testing out a recipe for my Thanksgiving dessert. I made a pumpkin pie, I know not groundbreaking, kind of basic. BUT I made it from an actual pumpkin and not canned pumpkin. Overall the process was pretty easy, just takes awhile for everything to bake. The pie was delicious too! I wish I could say I already knew what to wear, but who knows what our weather will be like in a month. I wanted to share a couple options over the next few weeks that could work for whatever weather your holiday brings you. The wild unknown of the forecast is one thing that makes this sweater such a great option. It has that cozy knit feel I love for fall and provides a small amount of warmth perfect for a light breeze. 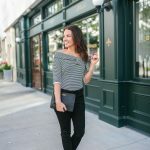 The knit does have larger holes and the sleeves are 3/4 length which makes it ALSO work for these warm days we can’t seem to shake. This sweater is see through. I have a camisole on underneath it. I dressed this look up a little bit with these pretty floral earrings that add color and sparkle to the look. Shoes are another great way to add color to an outfit. These flats are the perfect compliment to the soft pink of the earrings. I went with a simple long necklace to not distract from the statement earrings. All together I love this look as a casual Thanksgiving dinner outfit with family or friends. Comfy, Dressy, Classic, and small pops of color, just how I like it. I really love this look! Those shoes are a fabulous color! Love this outfit!!!! I will definitely be dressing comfortable for Thanksgiving this year! So pretty! I love your earrings and flats! That pop of pink is exactly what that sweater needs! Totally steps it up a notch. So cute! Love this soft look- those earrings are so pretty! Loving this sweater! It looks loose and comfortable. Perfect for eating too much pie and turkey! I love that sweater!! It didn’t look nearly as adorable on me!! 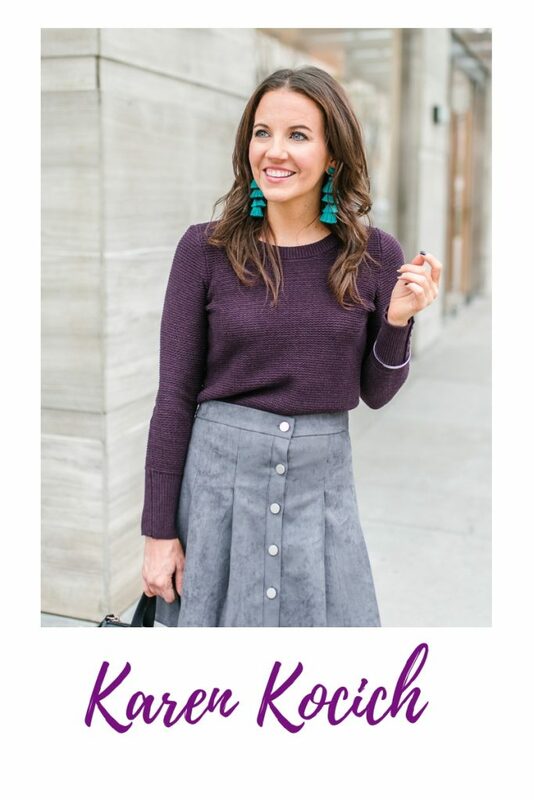 I love this sweater and those earrings are so cute! I can’t believe Thanksgiving is a month away! Those shoes…I keep wanting them. I know, I’m freaking out it’s almost November! Love this outfit – those earrings are perfect!!! 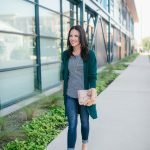 Love this fall look girl! Super cute! This sweater is so cute! Perfect for a casual Thanksgiving! First of all, good work on the pumpkin pie! Love this look for casual weekdays, if you work from home, or weekends. It’s comfortable, cozy, functional and stylish. The shoes and the earrings really make this outfit pop. Great option for a casual Thanksgiving. Love this outfit for a casual Thanksgiving! You’re right though, talking about it already does freak me out! Super cute earrings! Loving that cozy sweater too! I’m loving those jeans on you! And yes the title freaked me out, lol! Its going too fast! 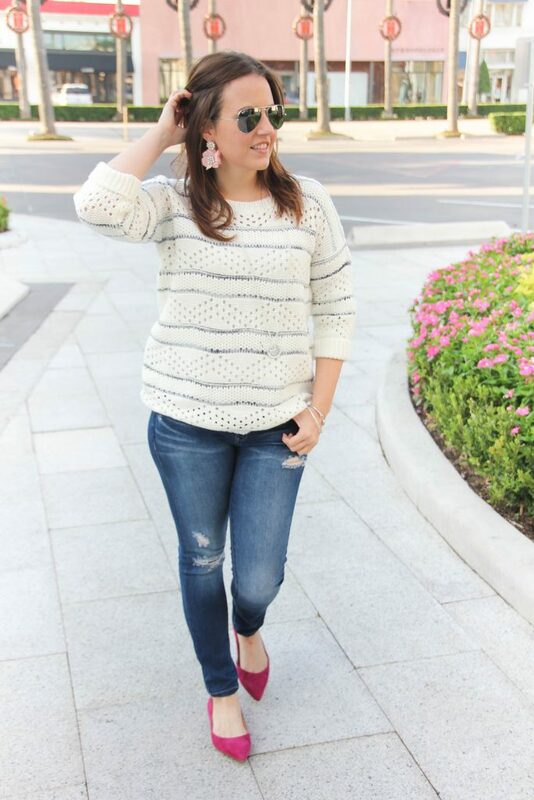 Cute sweater and love the pop of pink! So perfect! 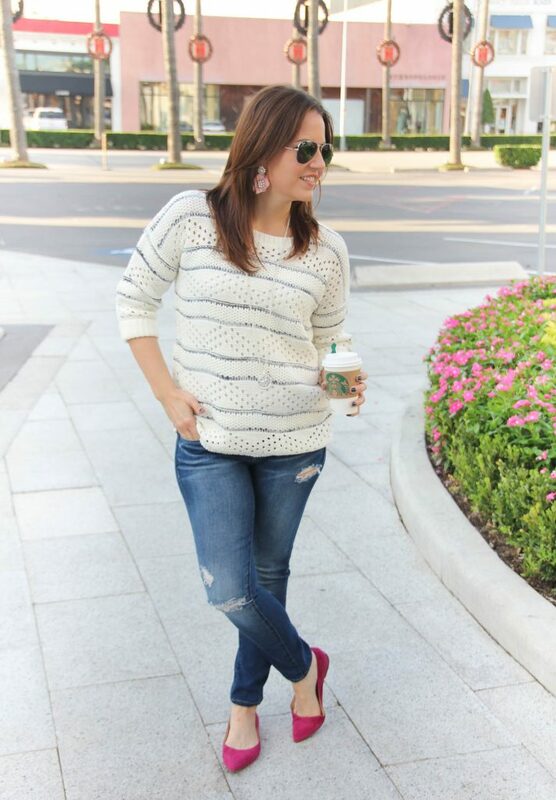 I love that cozy sweater and the pop of fuchsia on your shoes!